Actress Gwyneth Paltrow has been known for her keen sense of style ever since she launched her lifestyle website, Goop. Recently, she opened the doors of her stunning Tribeca apartment to photographer Björn Wallander and featured the home tour on her website. The home tour is everything you would expect from a luxury style maven. Husband and wife team Robin Standefer and Stephen Alesch of Roman and Williams designed the space that embraces a clean palette of white and luxe accents that make it look like you are stepping into a dream. There are many lovely textures and patterns that can be found throughout the home working in wonderful synergy. In the kitchen, marble stuns with white wood floors. In the living room, you’ll find a gorgeous wallpaper behind a swing filled with pillows. The fireplace brings a touch of history while the furniture juxtaposes it with modern lines. Enjoy this beautiful home tour of one of Manhattan’s finest apartments. A lovely wallpaper creates an accent wall behind the charming swing in the living room. A faux fur rug warms it up, while modern furniture contrasts the ornate fireplace. 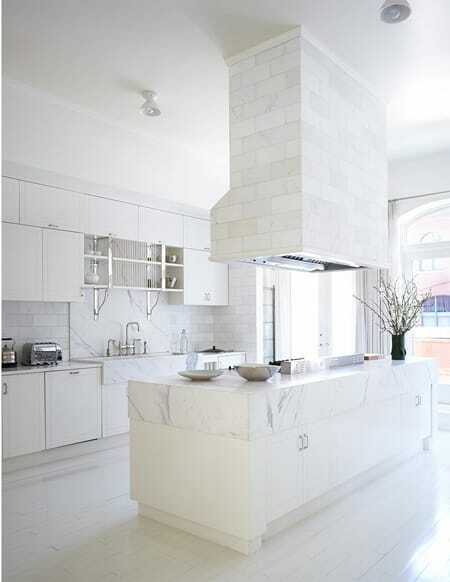 In the kitchen, marble covers the countertops, as well as the backsplash and range hood. Brick makes the two latter areas stand out from the countertop while still creating a beautiful flow. 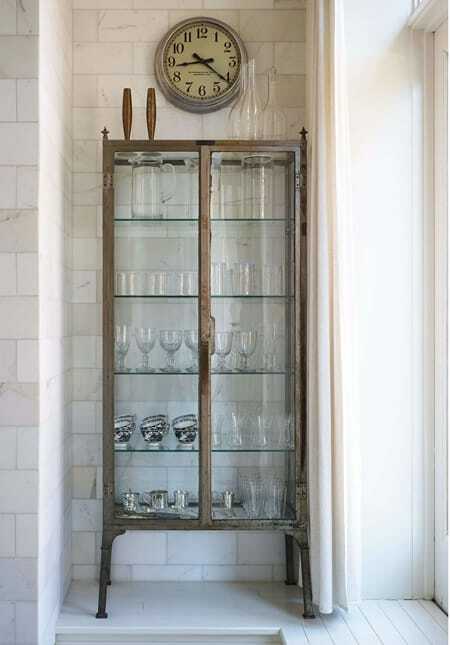 This antique cabinet adds a nice touch of character against all the sleek, white textures in the space. A black table contrasts nicely against all the white in this hallway to give it some visual interest. The swing in the living room features luxurious pillows and textiles that make it a comfortable spot for Gwyneth and the kids. The wallpaper from the living room is repeated in another area of the home behind a mid-century modern cabinet with a rich wood face. 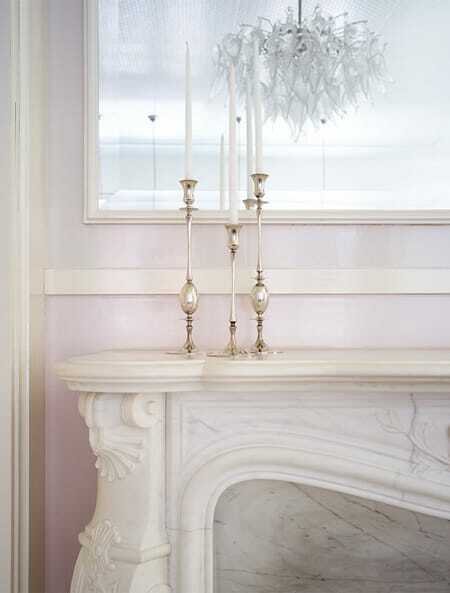 Here, you get a close-up look of the stunning marble fireplace. It looks soft and elegant against the subtle pink hue on the wall behind it. While this apartment wouldn’t be practical for some people to live in, it offers tons of beautiful inspiration that can be applied to your own home in smaller ways.